Tim Casey | Colorado Mesa Univ. 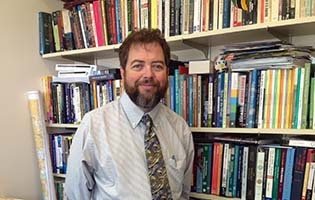 Tim Casey, PhD, received his Bachelor of Science in History from Northern Arizona University and went on to earn his Master of Arts in Religious Studies from the University of San Francisco and his PhD in Political Theory from Arizona State University. A professor of political science, Casey teaches Political Theory, Environmental Politics and Religion and Politics among other courses. Casey has also developed a broader social science course for general education, focusing on the interaction between technology and social systems. This course, like so many other teaching and research interests, highlights his deep commitment to interdisciplinary studies and the pursuit of understanding wherever that path might lead. His research interests include Canadian studies, natural resource policy and environmental thought. As Director of the Natural Resource Center at CMU, he is actively involved in a variety of research projects focused on the recreational use of public lands and the connection between communities and the landscape that surrounds them. Much of this research entails cooperative agreements with the Bureau of Land Management.